Did you know: That you can salvage an over-salted dish by mixing in some cream, milk, pureed tomato or mashed potato, as appropriate? That if you having trouble shelling an egg, with the skin under the shell sticking stubbornly, continue the process under running water and it will come away easily? The easiest way to skin impurities off the top of a stock or sauce is with a wad of crumpled kitchen paper? That you should never cover a pan of green vegetables during boiling or they will lose their colour? No matter how experienced the cook, there will always be occasions when things go inexplicably wrong, dishes are overcooked or perhaps the ingredients weren't quite good enough and the results fall a little bit flat. 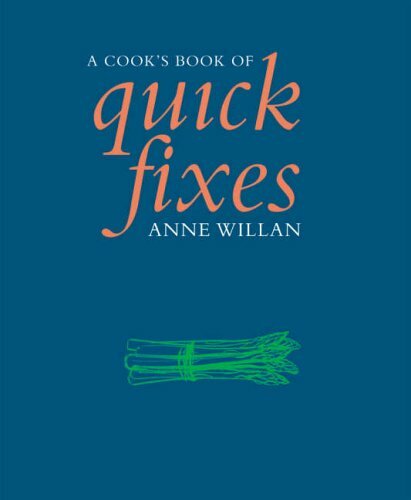 A Cook's Book of Quick of Fixes contains a wealth of simple, crafty remedies to save the day and to turn adversity to your advantage. With all the wisdom and experience of one of the world's leading cookery writers and teachers, the book is packed with invaluable hints and tips. It shows how to avoid common culinary pitfalls but also suggests alternative recipes to re-use a failed dish: Spruce up a dry or overcooked chicken with a marinade of oriental spices and flavourings. If a chocolate mousse fails to set, transform it into a rich chocolate sauce to serve as a dip for strawberries or layer it with slices of fresh orange or pear.